SNAP 2018 was comparatively easier than last year. The only area that could hinder the performance of the test taker was Reasoning where the Questions were time-consuming. Quantitative Ability was quite easy as was the Current Affairs Section. General English was of moderate level. The major change was the introduction of ‘Special Questions’ that carried double the marks and they lived up to the expectation. Now, we go in for a detailed analysis of the various sections. This section consisted of 35 questions for 40 marks. The Major surprise was that there wasn’t a single question from Data Interpretation though there were 3 questions from Data Sufficiency. In Quantitative Ability, there were 4 Questions from Arithmetic and Algebra which were quite easy. There were 4 questions from Permutation& Combination which were again not very difficult. Other questions were from Geometry, Mensuration & Logarithms. Overall, it was an easy section and a score of around 26 in 45 minutes would be a good job. This section consisted of 35 questions for 40 marks. As seen in the past, SNAP has a history of providing a different type of questions in this section and even this year it was no different. The only respite was that this section contained conventional questions. There were 4 questions on arrangements, 3 on coding-decoding, 1 each on the calendar, blood relation, analogy and set theory. There were 5 questions on missing numbers and series which were quite confusing. There were 2 questions on unfolding 3D shapes which were tricky. Considering that some of the questions in this section were confusing and time-consuming, the overall difficulty of this section can be termed as difficult. Investing around 35 minutes for a score of 20 would be a decent job in this section. This section again contained 35 questions for 40 marks. The level of difficulty of this section was lesser as compared to last year. Most of the questions were straightforward. There were 10 questions from Reading comprehension and the rest from Verbal Ability and Verbal Reasoning. There were two RC passages. One passage was on Google’s Location tracking system and the other was on Trade Liberalization. The first passage was easy but the second was lengthy and had inference based questions, so ideally attempting the Google passage was a good bet. The Verbal Ability and Verbal Reasoning section had questions basically on Vocabulary and Grammar. There were 10-12 vocabulary based questions from topics like Synonyms, Antonyms, Odd man out etc. There were another 12-15 questions from Grammar based on active passive voice, word usage. Three fill in the blanks on preposition and conditional tense were also there. There were 2 questions on match the following and another 4-5 questions on Sentence Correction. In terms of Verbal reasoning there were 2 questions on analogies and jumbled sentences/words. Overall, this section was Easy to Moderate and allocating 30 minutes for a score of 21 would be a good job in this section. There were 25 questions for 30 marks. As indicated earlier, the questions in this section were under the 2-year limit. Questions from the 2018 Assembly elections were a major happiness factor for the aspirants. The questions in this section were from areas of Politics, Business, Sports, Who’s Who, Technology and Awards. There were 5 questions on Politics, 6 from Business, 3 on Awards and rest from the other fields. A well-read test taker would find this section to be easy and allocating a time of 10 minutes for a score of around 14 would be a good job in this section. 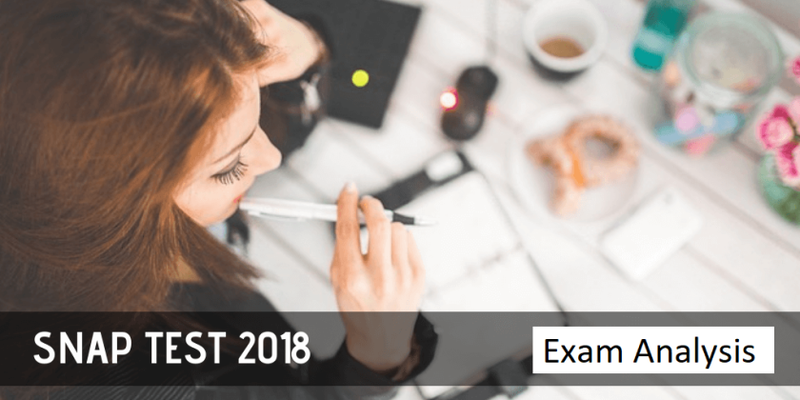 Now, that SNAP 2018 is over, it’s time to gear up for XAT 2019 and begin our GD/PI/WAT preparation. Students of CF Patna are raring to go beginning tomorrow and it’s time for the others to begin too. All the Best & Happy Learning.